This Saturday’s championship game at IS8 was filled with plenty of theatrics. 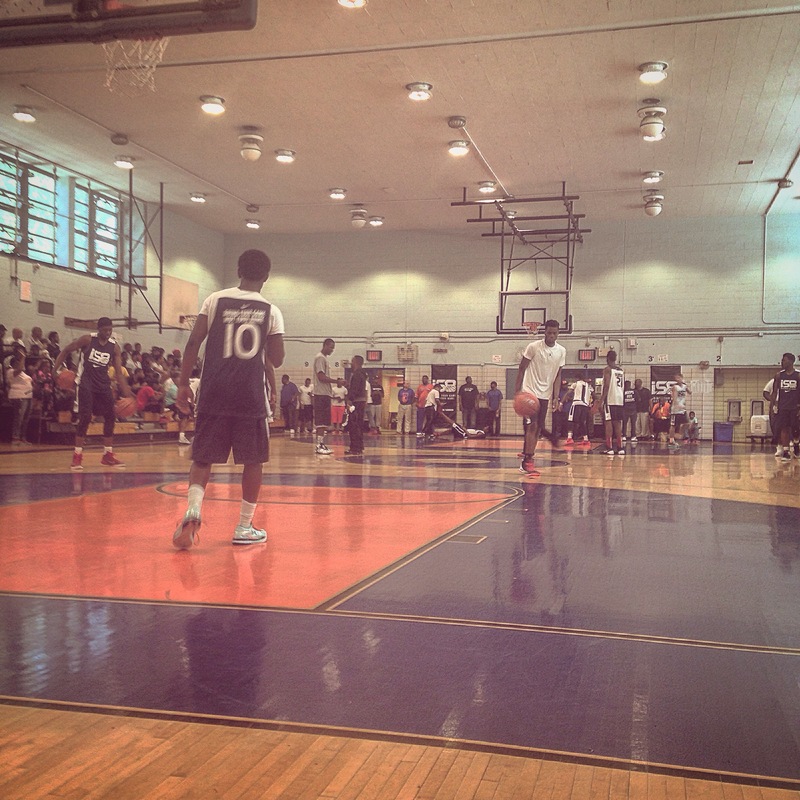 It was an all-Queens battle between Sean Bell All-Stars and the defending champions, 2G’z Entertainment. Both teams had plenty of elite talent throughout the tournament, but now it was time to showcase their talents against one another for the championship trophy of the historically famed Queens tournament that has produced the likes of many college and professional players such as LeBron James, Sebastian Telfair, J.R. Smith, Kyrie Irving and Tristan Thompson to name a few. From the gate, it looked like 2G’z had control of the game behind baskets by Hofstra-bound Justin Wright-Foreman and Daquaise Andrews. But then Sean Bell came back on the baskets of Samuel Idowu, who is bound for St. Peter’s College and Davon Dillard, who is bound for Cal-Berkeley. The first quarter ended at 20-19. Then the second quarter ended up being a duel between both teams on the offensive side. Desure Buie, another Hofstra commit, made his presence felt with a 15-point jumpshot and a quick steal with a basket to bring Sean Bell to a 36-31 lead with less than 3 minutes left in the quarter. That led to Sean Bell finishing the half leading 47-38. The third quarter started off just like the beginning of the game with Andrews and Wright-Foreman slashing through the lane and scoring big baskets for the reigning champions. But then Sean Bell hammered away and dominated the third quarter by stepping up their defense and making crucial baskets. At the end of the third quarter, Sean Bell ended up leading by 20 points. 2G’z Entertainment tried to come back behind the hot shooting of Elmont junior Travis Morgan, but it was too little, too late as the Sean Bell All-Stars emerged as the winners of the IS8 Spring Championship with an 89-74 victory. Davon Dillard led Sean Bell with 24 points and Desure Buie chipped in with 23 points as both were named Co-MVP awards for the winners. Justin Wright-Foreman led all scorers with 31 points, while Daquaise Andrews chipped in with 20 points and won the Sportsmanship award. It was a fitting end to a great game as there was plenty of great crowd excitement as well as great talent and great coaching in the building. Justin Wright-Foreman, High School of Construction (NY), Class of 2015 – Wright-Foreman has a good jumper, is athletic and finds plenty of ways to score. He will be headed to Hofstra University in the fall. Davon Dillard, Our Savior New American (NY), Class of 2015 – Dillard is a big guard that can score in bunches and is a tough player that makes his presence felt on both ends of the court. He will be headed to the University of California-Berkeley in the fall. Desure Buie, Wings Academy (NY), Class of 2015 – Buie is a small guard with plenty of playmaking ability, but also knows how to score. He can be aggressive in getting to the cup despite his small size and is a dangerous shooter. He will be headed to Hofstra University in the fall. Daquaise Andrews, Impact Academy (FL), Class of 2015 – Andrews is a pure scorer. He can get into the lane efficiently and is aggressive at getting to the basket. Samuel Idowu, Lafayette (NY), Class of 2015 – Idowu is a bruising forward that is dominant around the paint, but also has a nice shooting touch. He will be headed to St. Peter’s College in the fall. Jahlil Tripp, Lincoln (NY), Class of 2016 – Tripp is a versatile player that knows how to attack the basket and score at will. He holds offers from UNC-Wilmington, Fairfield, Manhattan and Quinnipiac. Christian Wilson, Holy Cross (NY), Class of 2016 – Wilson is a player with a good skill set. He is an efficient shooter. He holds offers from Columbia, Stony Brook, Yale, Boston University and Holy Cross. Travis Morgan, Elmont (NY), Class of 2016 – Morgan is a guard that can knock down shots from many places on the court.